Plexidor Pet Doors: Doggie driver's license? 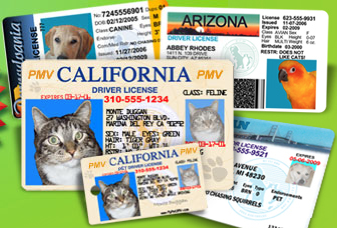 When I first heard about MyPetDMV.com I thought it was an unusual idea. I mean, why would a dog need a driver's license, right? After visiting their Facebook page a few times, I saw the pet gets a name tag too, and I was curious enough to try. This was about two years ago. Today, all my pets have licenses and name tags. They're really cool, and make a great gift for pet lovers. I love that the dogs carry something with their names, address, and my phone number. I don't mean for them to get away, but it could happen. Also, if something does happen, I have the identifying information with a photo in my wallet. The cool design is a bonus. Every time someone asks my husband for ID he pulls out one of the dogs'. It's priceless. That's awesome, Emma! You look good on your license photo! =D Drive safe, there are many humans out there who shouldn't be operating vehicles, LOL.